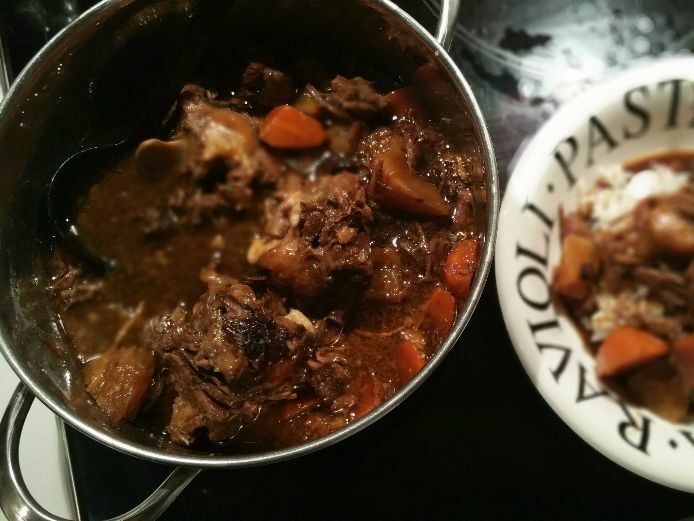 This recipe is prepared in the Instant Pot DUO, use the meat/stew program done in 30 min. If prepared in a slow cooker or stove top cooking approximately 2-4 hours depending the cut size large or small parts of the tail. While turning everything around add the spices; cinnamon and star anise. As soon as they release aroma, add the ginger first than garlic keep stirring the pot to mix and fry at the same time. With all the brown bits sticking pour in the Chinese wine and scrape the bottom loose. Then add the fresh cut chilli - *optional extra flavourings is to add the bean sauce (hot bean sauce or pixiandouban. This will give an intense (heat) flavour, if used cut down the soy sauce to 2 Tb. (taste at the end of cooking, add if needed, most likely not). Next add the soy sauces, water with mandarin peel and lumps of rock sugar. End the sauté program, close the lid and start the stew program. The display will show 30 min. npr 10-15 min qpr 5 min. Open the lid and you'll see tender flavourful braised oxtail meat, the gravy is just amazing. Optional: You can serve it right away, but since I was ahead of my dinner time. I decided to cut up a carrot and a cassava (Paleo touch, gluten free diet) added it to the pot closed and set on slow cooker mode. Opening the lid again you will see meat so tender it falls of the bones with moist vegetables while still retaining their shape in cubes. Get a spoon and sample your first bite, add salt & pepper if needed. Serve straight away, on its own with carrots and cassava it is a hearty and nutritious dish. Or if you like with plain white rice or flat noodles on the side with some fresh herbs scattered on top. *at different occasions I ran out of one of the ingredients and found these substitutions good additions. However do not use them all together that might be an overkill of strong flavours all together.